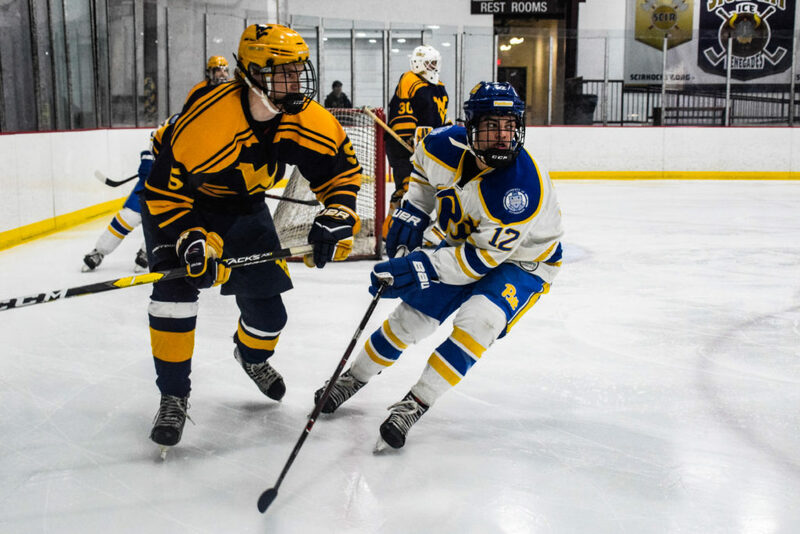 HARMAR Twp., Pa — The Pitt Panthers clinched a playoff berth Friday night with a 4-1 win over rival West Virginia in the latest edition of the Backyard Brawl at Alpha Ice Complex. Alex Crilley scored the opening goal for the Panthers at the 18:09 mark of the first period. Wyatt Murphy scored on the other side of the first intermission to tie the game at 1-1 for the Mountaineers. It took until the midway point of the third period for the tie to be broken again. Jack Bertolami scored to give Pitt a 2-1 advantage. Milo Defay added an insurance goal with just over two minutes to go and Jacob Tepe put in the empty net goal to seal the 4-1 win and earn Pitt a playoff berth for the third season in a row. The Panthers also defeated the Mountaineers by the same score on Saturday in Morgantown, sweeping the season series and making it four wins in a row over West Virginia. The top six teams qualify for the CHMA Tournament (March 1-3 @ Alpha Ice Complex). The top two seeds based on points will receive a first-round bye. No. 3 will play No. 6 and No. 4 will play No. 5. The playoff winner will receive the conference’s automatic bid to the 2019 ACHA National Tournament in Frisco, Texas at the end of March. Pitt clinched a playoff spot with a victory over West Virginia on February 8. The IUP Hawks can clinch a first-round bye in the playoffs with wins over Slippery Rock on Thursday, February 14 and Duquesne on Saturday, February 16. Robert Morris clinches a playoff spot with a win over West Virginia on Friday, February 15. IUP holds the head-to-head tiebreaker over Duquesne, defeating the Dukes 5-1 on October 12. The two teams will play again on February 16 at 9:30 PM. John Carroll holds the head-to-head tiebreaker over Mercyhurst and West Virginia with one win over each so far this season.